Falling business a gross misjudgement of freight rate movements have dealt a double blow to COSCO. Falling business and a gross misjudgement of freight rate movements have dealt a double blow to China's COSCO Holdings (COSCO), threatening to plunge the world's largest dry bulk carrier deep into the red. The company's outlook for 2009 seems bleak as the global shipping industry is expected to remain in the doldrums for most of the year, if not longer Shortly after COSCO announced a surge in profit for third-quarter 2008, it posted a chilling statement on Dec 16 on the Shanghai and Hong Kong bourses disclosing a 3.95 billion yuan potential loss arising from "misjudgment" in Forward Freight Agreements (FFA). In the disclosure, the company conceded that the situation was "serious", setting off a wave of selling of its shares. COSCO shares decreased by 5.5 percent from 8.78 yuan on Dec 16 to 8.23 yuan on Jan 12 in the Shanghai Stock Exchange, while falling by 6.4 percent from HK$5.61 to HK$5.25 in Hong Kong trading. Because of the worldwide trade slump, the Baltic Dry Index (BDI), on which the FFA pricing is based, decreased by 85 percent in the first three quarters of 2008 from the average 8,130 points to 1,169 points. Dry bulk cargo shipment contributes more than 60 percent of COSCO's total revenue. Analysts said that as the BDI continues to fall, potential losses of the company in FFA contracts will grow larger than previously expected. CITIC Securities Co Ltd estimated that COSCO's fourth-quarter loss could reach 5 billion yuan, in contrast to a 5.5 billion yuan profit for the previous three months. "The shipping industry slump will last for at least one or two years," predicted Qian Hongwei, analyst of China Securities Research Co Ltd, "The fortune of the shipping industry is tied to the recovery of the global economy, which can be a long time away." To conserve cash in these trying times, COSCO has reportedly canceled some shipbuilding orders and requested a delivery delay for others. Those moves have affected orders for 126 vessels. The company notified the Hong Kong stock exchange on Dec 22 that it was seeking to raise up to 10 billion yuan of new capital by a bond issue to help fund projected expenditure in fixed asset investment, fuel, labor and debt servicing. The company's latest financial report showed that it had 10.8 billion yuan in cash at the end of September. 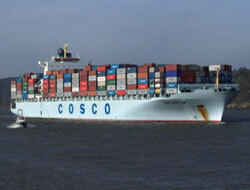 COSCO said it will try to maintain "sound and healthy financial status" by cost control and investment compression. It also has planned to reduce container shipping capacity to Europe and the US and explore potential new markets in Asia.